Social network Twitter has launched in the Australian market its solution to take advantage of the relationship between the service and broadcast TV. Twitter Amplify allows media owners to publish video to Twitter and then jointly monetise the premium content by creating sponsorship packages, powered by Promoted Tweets, to ‘amplify’ the reach of the video content distributed via the media owners’ Twitter handle/s. For advertisers, it extends the reach of TV sponsorships into mobile and social areas, allowing them to tap into the social conversation on Twitter. Network Ten and Southern Cross Austereo’s celebrity news brand Scoopla have been named as media partners for the service, as well as advertisers L’Oréal and Samsung. 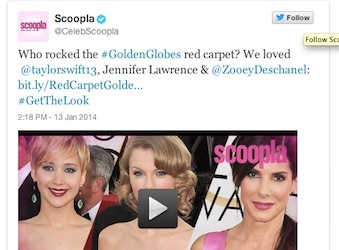 Scoopla and L’Oreal Paris Australia have also collaborated on a video program on Twitter for the Golden Globes, the Grammys and the Oscars and Channel 10 and Samsung are reportedly working together to extend broadcasting of the XXII Olympic Winter Games in Sochi, Russia on Twitter. A recent blog by Twitter has detailed how successful the social media platform has been as a key driver for multi-platform strategies with 76% of users accessing the service on mobile, and 95% of the public social conversation around TV happening on Twitter. Network Ten chief sales officer, Louise Barrett, added: “We’re really excited about this latest addition to our digital advertising offering. Twitter and television go hand-in-hand. Audiences are increasingly discussing television in the social space, sharing their reactions to nail-biting season finales and thrilling sporting moments. We want to make the most of this new dynamic between audiences and programming. “Twitter Amplify is an innovative way to engage with these audiences while they are most active, reaching the social conversation wherever it happens, and allowing us to measure how socially responsive people are to television campaigns,” she said.